After a break of 4 years, it was great to get back to the Drug Delivery to the Lungs conference (DDL2017) in Edinburgh this year. After the snow and gales of previous years when I have visited it was rather quiet in terms of weather this year, but not in terms of content as this was varied and interesting. I caught up on some of the latest advances in inhaled device development targeting special populations, such as small children or critically ill patients. It was really exciting to see the move towards using smartphone technology apps linked to whistle accessories on devices which help teach patients how to use their device efficiently. Also, to see what we might be able to learn from the world of E-cigarettes and Vaping. The annual lecture was a highlight for me as it looked back over the last 50 years of devices, drugs, and detection of disease, I found it fascinating to see how inhalation treatment has developed and changed. 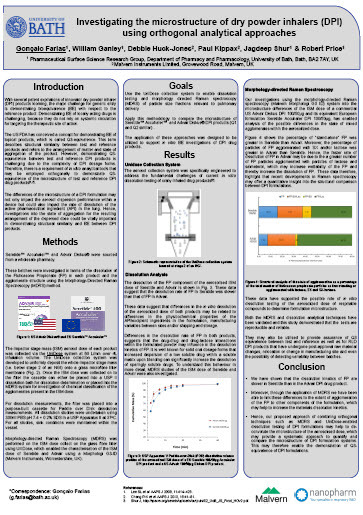 There were over 100 posters at the event, two of which Paul Kippax and I co-authored with researches in the Department of Pharmacy and Pharmacology at the University of Bath. The first was titled “Investigating orthogonal in vitro approached to demonstrate bioequivalence of nasal suspension formulations”. We demonstrated that a combination of dissolution testing and morphologically-directed Raman spectroscopy (MDRS®) of a nasal suspension was able to discriminate between differences in API particle size in nasal suspension formulations. The approach allowed characterization of particle size distribution of the API in the formulation facilitating comparative analysis of test and reference products to help determine bioequivalence of nasal suspensions formulations using in vitro methods. 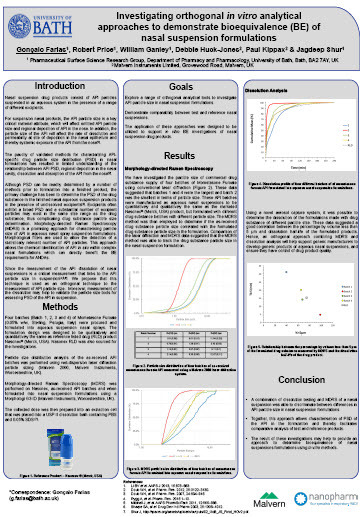 The second poster was titled “Investigating the microstructure of dry powder inhalers using orthogonal analytical approaches“. Here we proposed an approach combining MDRS with UniDose-enabled dissolution testing for DPI formulations to help to deconvolute the microstructure of the aerosolized dose. We showed that the dissolution kinetics of the APIs were slower in Seretide than in the Advair DPI drug product and that the application of MDRS enabled us to link this to the agglomeration of one of the actives other components of the formulation. We proposed that this approach may enable the demonstration of Q3-equivalence of DPI formulations. We followed this poster presentation up with a webinar last week where Gonçalo Farias and I presented our findings. 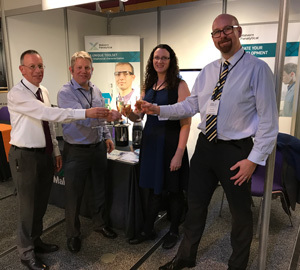 We had a Mastersizer 3000 on the Malvern Panalytical stand and it was really good for Paul, Andrew, Jon and I to be able to catch up with customers and collaborators during the poster sessions and wine receptions. I had plenty of interesting discussions about the findings presented in our posters and about how MDRS and the Morphologi G3-ID can be used within the development of DPIs and nasal sprays. 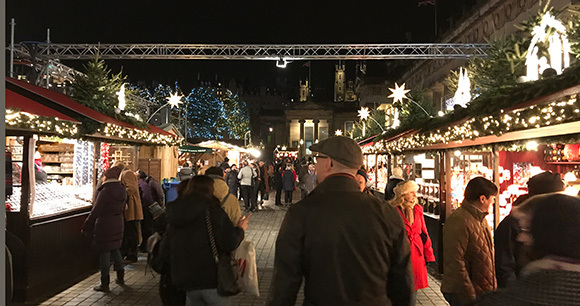 Finally, being in Edinburgh on the approach to Christmas we just had to make a visit to the Christmas markets I remember going the first time I went to DDL when it was just a couple of stalls then, so I was very pleasantly surprised how much it had grown. A good time for a bit of Christmas shopping.